114 To cure a wound though the patient be never so far off Take a quart of pure spring water and put into it some Roman Vitriol and let it dissolve. 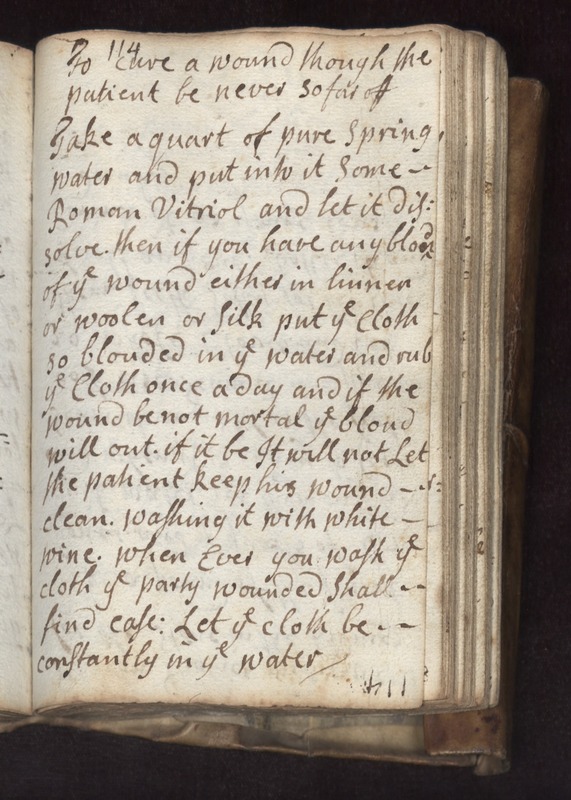 Then if you have any blood of ye wound either in linnen or wollen or silk put ye cloth so blooded in ye water and rub ye cloth once a day and if the wound be not mortal ye blood will out. If it be it will not let the patient keep his wound clean. Washing it with white wine. when ever you wash ye cloth ye party wounded shall find ease. Let ye cloth be constantly in ye water.